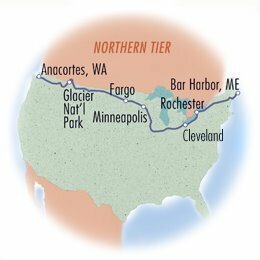 Are you interested in bicycling across the country on the Northern Tier route? We've cut the tour in half to make it easier on your busy schedules. We'll run the Eastern half from North Dakota to Maine this year, and the Western half from Washington to North Dakota in 2020. We last ran these trips seven years ago and it will probably be just as long until we're able to do them again. Do just one half or both. Come ride what many cyclists believe to be the prettiest cross-country route of them all! 2440 miles with an average of 59 miles per day with 6 rest days. You’ll experience all types of terrain in all types of weather. Fly into Fargo, ND and out of Bangor, ME. 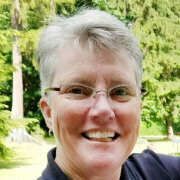 "WomanTours proved to be a good company for me to fulfill a long time dream of going cross-country when I retired. There’s nothing like such an experience as hearing the birds, seeing the fields, the hills and dales, farms and cities, and yes, sometimes struggling up long climbs, to know that it’s possible to stretch one’s self and physically accomplish more than you ever dreamed you could." It was even better than last year's Southern Tier! We’ll start our cross-country tour on the Northern Tier in 2019 and finish it in 2020. We’ll start this Eastern Segment in Fargo, ND and continue through the states of Minnesota, Wisconsin, Iowa, Illinois, Indiana, Ohio, Pennsylvania, New York, Vermont, New Hampshire and Maine. We’ll celebrate the finish of our tour by dipping our tires into the Atlantic Ocean. We’ll bike along the shores of two of the Great Lakes – Erie and Ontario, and right by the fantastic Niagara Falls. After cycling by WomanTours headquarters, you’ll bike through Adirondack State Park, near the shores of Lake Champlain and over the Green Mountains of Vermont. We’ll end the tour in beautiful Acadia National Park. There will be 6 rest days over the course of the trip. We schedule these at scenic stops where there is an opportunity to explore the area. We strongly believe in giving everyone time to see the natural wonders of our country and to relax and keep our bodies healthy and strong. We offer healthy, home-cooked meals prepared by our traveling chef who understands the “performance food” needed to undertake such a challenge. 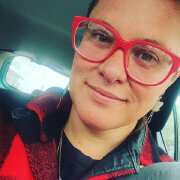 She'll accommodate food allergies and provide a non-meat protein source for vegetarians, but if you require a vegan or gluten-free diet, there will be a $300 surcharge. TO JOIN: Sign up by making your non-refundable, non-transferable registration deposit of $300. Save $500 off the tour price if you sign up before July 1, 2018. The first payment of $1,000 is due October 1, 2018 and is nonrefundable and nontransferable. The second payment of $2000 is due December 1, 2018. The balance of the trip fee is due March 1, 2019. Save 2% if you make your payments by check. All payments are nonrefundable and nontransferable. Our cross-country tours often fill early and have waiting lists. DISCOUNTS: Sign up by July 1, 2018 and save $500 off the tour price. Sign up for any shorter, domestic WomanTours trip in 2018 or 2019 at the same time you register for the 2019 Northern Tier Eastern Half and receive a 10% discount on the shorter tour. Save 2% by paying by check or wire transfer.